The following definitions are based on entries from the USACE's comprehensive Glossary of Coastal Terminology. (1) A lessening of the amplitude of a wave with distance from the origin. (2) The decrease of water-particle motion with increasing depth. Particle motion resulting from surface oscillatory waves attenuates rapidly with depth, and practically disappears at a depth equal to a surface wavelength. A float; especially a floating object moored to the bottom. CDIP's buoys are equipped with sensors so that, in addition to floating, they can measure climatological variables such as wave height, swell direction and water temperature. (1) the highest part of a wave. (2) That part of the wave above still-water level. The phenomenon by which energy is transmitted laterally along a wave crest. When a part of a train of waves is interrupted by a barrier, such as a breakwater, the effect of diffraction is manifested by propagation of waves into the sheltered region within the barrier's geometric shadow. (1) The front of a wave as it advances shoreward, after it has broken. (2) Lines of foam such as those which move around the head of a rip current. The theoretical determination of future wave characteristics, usually from observed or predicted meteorological phenomena. The waves that form when wind blows for a sufficient period of time across the open ocean. The waves of a fully developed sea have the maximum height possible for a given wind speed, FETCH and duration of wind. (1) The vertical rise or fall of the waves or the sea. (2) The translational movement of a craft parallel to its vertical axis. (3) The net transport of a floating body resulting from wave action. (1) In beach terminology an indefinite zone extending seaward from the shoreline well beyond the breaker or surf zone. (2) The zone which extends from the SWASH zone to the position marking the start of the offshore zone, typically at water depths of the order of 20 m.
The study of the sea, embracing and indicating all knowledge pertaining to the sea's physical boundaries, the chemistry and physics of seawater, marine biology, and marine geology. (1) The process by which the direction of a wave moving in shallow water at an angle to the contours is changed: the part of the wave advancing in shallower water moves more slowly than that part still advancing in deeper water, causing the wave crest to bend toward alinement with the underwater contours. (2) The bending of wave crests by currents. (1) A standing wave oscillation of an enclosed waterbody that continues, pendulum fashion, after the cessation of the originating force, which may have been either seismic or atmospheric. (2) An oscillation of a fluid body in response to a disturbing force having the same frequency as the natural frequency of the fluid system. Tides are now considered to be seiches induced primarily by the periodic forces caused by the Sun and Moon. (3) In the Great Lakes area, any sudden rise in the water of a harbor or a lake whether or not it is oscillatory (although inaccurate in a strict sense, this usage is well established in the Great Lakes area). (1) Commonly, water of such a depth that surface waves are noticeably affected by bottom topography. It is customary to consider water of depths less than one-half the surface wavelength as shallow water. (2) More strictly, in hydrodynamics with regard to progressive gravity waves, water in which the depth is less than 1/25 the wavelength. The quality, state, or condition of being distorted or lacking symmetry; the quality or state of asymmetry shown by a frequency distribution that is bunched on one side of the average and tails out on the other side. It results from lack of coincidence of the mode, median, and arithmetic mean of the distribution. Also a measure of asymmetry of a frequency distribution; specifically the quotient of the difference between the arithmetic mean and the mode divided by the standard deviation. Positive skewness is defined for the longer slope of the plotted distribution in the direction of increasing variate values (mean greater than mode, or coarser particles exceed finer particles in a particle-size distribution); negative skewness is defined for the longer slope of the plotted distribution in the direction of decreasing variate values (mode greater than mean, or finer particles exceed coarser particles in a particle-size distribution). (1) Breaking waves near the shore. (2) The wave activity in the area between the shoreline and the outermost limit of breakers. (1) The term which applies to the WIND WAVES and SWELL of lakes and oceans, also called a SURFACE WATER WAVE, SURFACE WAVE or DEEP WATER WAVE. (2) A progressive GRAVITY WAVE in which the disturbance is confined to the upper limits of a body of water. Strictly speaking this term applies to those progressive GRAVITY WAVES whose velocity depends only upon the wavelength. (1) The name applied to wave motion with a period intermediate between that of the ordinary wind wave and that of the tide, say from 2 to 60 min. It is low height, usually less than 0.9 m (3 ft). See also SEICHE. (2) see STORM SURGE. A long-period wave caused by an underwater disturbance such as a volcanic eruption or earthquake. Also SEISMIC SEA WAVE. Commonly miscalled "tidal wave." (1) Waves being locally formed and built up by the wind; SEAS. (2) Loosely, any wave generated by wind. What do Hs values represent? The wave height (Hs) represents a 30-minute average of the 1/3 highest waves at a sensor. The height is the distance between the trough and the crest of the wave. Statistically, the highest wave during the measurement period is likely to be approximately twice the reported wave height (1.8*Hs). What are Tp and Dp? Why are there different values given in different products? The period of waves is the time it takes two consecutive crests to pass a single spot, and the direction is the compass angle (0-360 degrees clockwise from true North) that the waves are coming from. In the ocean, however, no two waves are perfectly identical - they are constantly coming from different directions at different frequencies. Since there is never just a single direction or period for ocean waves, we can only measure the peak period (Tp) and peak direction (Dp). 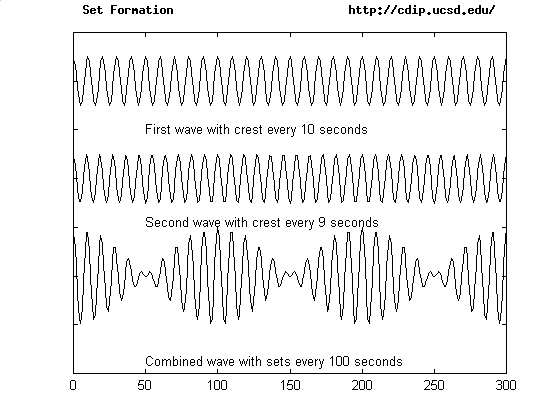 The peak period is the most common period between consecutive waves, while the peak direction is the most common direction. To come up with these values, all of the wave energy for a station over a specified period of time - approximately 30 minutes, in most cases - is grouped into different bands. For instance, in CDIP's 9-band products, all waves with periods from 6 to 8 seconds go into the 7-second band, those from 8 to 10 secs go into the 9-second band, etc. After all of the wave energy has been divided into these bands, the band with the most energy is selected as the peak band. The cutoffs between bands, however, are arbitrary, and changing the cutoffs and/or number of bands affects the resulting Tp and Dp values. At CDIP we use two formats for analysis, 9-band and parameter. In the the 9-band products, all of the wave energy is divided into 9 broad bands. In the parameter products, the energy is split into 64 (or 128) narrow bands. As a result, the 9-band Tp and Dp give more general, broad values, while the parameter Tp and Dp identify finer, subtler peaks. So which Tp/Dp values are better? It depends what you're looking for. For instance, the broad bands of the 9-band values are better for addressing general questions about the sea state (e.g. which is currently predominant - local seas or ground swell?). To pick up more subtle features - like the arrival of long-period swell from a distant storm - the parameters values may be more helpful. Are your sea temperatures correct? At the beach the lifeguards are reporting 63F, but the buoy says 70F! There are often big differences between inshore and offshore temperatures due to various phenomena. In the surfzone, for instance, mixing may result in temperatures much colder than in calm surface waters offshore. Our buoys are all located offshore and measure sea surface temperature using a sensor located about 18 inches directly below the buoy. Very often waves from different parts of a distant storm arrive here at the same time. Their period (or lengths) can be nearly the same size. For a while the crests of the two wave trains begin to coincide. The two trains adding together result in waves that grow bigger. Later, the troughs of one begins to coincide with the crests of the other. The combination wave grows smaller. We see this as a "set" of large waves, followed by an interval of smaller waves. See figure below. Why are wave heights sometimes underestimated on windy days? Local winds generate very short-period, high frequency waves, and not all of CDIP's instruments can measure these waves effectively. This is especially true of pressure sensors postioned deep underwater. At Kings Bay, for example, the sensors are mounted at a depth of 55 feet. Due to attenuation, these sensors do not feel high frequency waves, and so on windy days the high frequency energy will not be reflected in the reported Hs. Why are the times on your buoy data often an hour or more old? Can't the data be more up-to-date? For a more in depth discussion of wave measurements and standards, we recommend the Coastal Engineering Manual (CEM), published by the United States Army Corps of Engineers' Coastal and Hydraulics Laboratory.